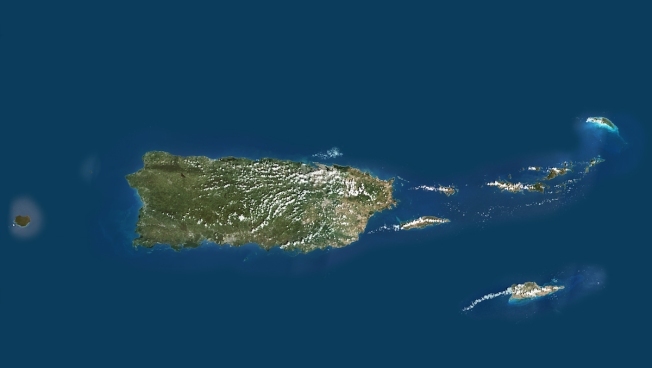 True colour satellite image showing Puerto Rico and the surrounding area of the Atlantic Ocean. The Puerto Rico Trench is north of Puerto Rico. Explorer and multimillionaire Victor Vescovo just reached the bottom of the Puerto Rico Trench, NBC News reports. The trench is the deepest point in the Atlantic Ocean. Vescovo became the first person to do so on a solo mission in a manned submersible vessel and the second ever to make a solo dive deeper than 5,000 meters (16,400 feet), according to a statement released by the Discovery Channel which will air a documentary of the expedition in the upcoming years. The deepest point of this trench plunges to 8,376 meters (27,480 feet) below the surface of the ocean. James Cameron, in the Deepsea Challenger vessel, dove deeper in 2012 to 10,908 meters (35,790 feet) down in the Mariana Trench in the Pacific Ocean, the world's deepest spot. "It felt great to get to the true bottom of the Atlantic Ocean for the first time in history and to prove the technical capabilities of this diving system, which we believe is now the deepest operational one in the world," Vescovo said in the statement. "We are really looking forward to continuing to the other dive sites, and continuing our technical and scientific goals."